Can you still have heartburn while on Nexium? This question occupies tens of millions of heartburn sufferers who have been let down by the conventional medical treatment. Heartburn, acid-related diseases and their complications have presented researchers with a major therapeutic challenge for over a century. An increasingly effective series of pharmacological innovations has emerged bringing about reduction in the pain and suffering experienced by patients. Proton pump inhibitors or PPI class of drugs which include Prilosec, Nexium and Prevacid are the drugs of choice in achieving symptom relief, improving the quality of life, healing, and preventing mucosal injury in heartburn patients. These drugs are considered quite safe. The stomach produces hydrochloric acid which is necessary to digest food, but an excess can cause heartburn and damage the sensitive lining of the esophagus. Nexium reduces the amount of acid produced in the stomach so that the esophagus can begin to heal. It is designed to be used for short-term treatment (4 to 8 weeks). For some patients who have not healed after 4 weeks, another cycle for 4-8 weeks may be prescribed. Use of Nexium is not recommended for longer than 6 months. While Nexium gives excellent results for acid control, sometimes the dose needs to be adjusted by the doctor if heartburn is not relieved on taking Nexium. If not taken regularly or in the manner prescribed by the physician, the heartburn may still persist. Some patients may also be refluxing bile causing heartburn despite being on Nexium. The treatment of bile reflux typically involves medication that either results in an increased flow of bile through the digestive tract or that binds the bile. Other possibilities for heartburn while on Nexium include motility disorders of the stomach which can cause regurgitation of liquid up the esophagus. In gastroparesis, for example, the muscles of the stomach do not contract normally, and hence prevent the stomach from emptying. This can result in regurgitation, nausea and even vomiting. Nexium may also cause adverse effects in some patients like headache, diarrhea, abdominal pain, and nausea and constipation and bloating. All these symptoms normally occur concurrently with heartburn and the patient may not find relief in spite of taking Nexium. That said the answer to the question "can you still have heartburn while on Nexium?" is positive. Most people ignore heartburn at first. But it is a symptom of something wrong with the digestive system. Nexium will just cover up the symptoms. Apart from covering up the symptoms, Nexium has also been found to increase the risk of contracting pneumonia simply by reducing stomach acids that kill those germs that cause it. Nexium also interferes with the absorption of calcium increasing the risk of hip fractures and osteoporosis. The only way to deal with heartburn is through holistic medicine. It deals with "Why heartburn happens?" instead of merely acting as a band-aid. 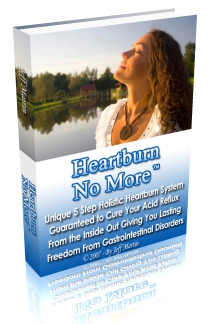 Once the cause is removed, the heartburn will go away and there will be an overall improvement in health too.